We provide the highest standard in commercial and domestic & Professional Carpet , upholstery and rugs cleaning Sydney. We give stains a real going over ! One of the most important areas of any carpet steam cleaning process is the treatment or removal of spots and stains. While there is no guarantee that everything can be removed, if the problem area is treated correctly, the chance of success is 90%. Carpet steam cleaning or carpet dry cleaning are two ways to clean carpet. Using a buffing or rotary machine with low RPM to scrub the carpet with special pad. A soap solution is sprayed onto the carpet. - Not special training required. - Carpet pile is rubbed with pad and soil contain in the pad. - Remove all stains it is very hard and expensive. Use necessary pre-treatment, spray warm carpet solution. Agitate carpet specially heavy traffic area. Use high pressure jet to spray water then rinse carpet . Remove all soil and solutions and extracted by powerful vacuums. - Soil and other contaminants will be removed. - Most general stains are removed without special treatment. - You can still walk on your carpet while it has damp on it. - Carpet has moister than carpet dry cleaning (although they can still be walked on). - Advance knowledge needed to clean carpet. 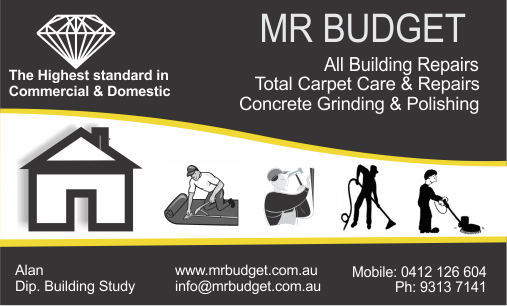 We Provide the highest standards and Professional in Commercial, Domestic Carpet Cleaning Sydney & Restoration in Sydney. Hiring the right contractor can make all the difference in a building project. We always work on carpet stain removal and we try to removed stain as much as possible. Our site will guide you through several commercial and residential projects we have done. If you would like your carpet and upholstery cleanin Sydney just give us a call. We look forward toworking with you. Carpet Cleaning to Australian Standards Number AS3733-1995. This photo has not been touch. From $190.00 for one bedroom unit. From $190.00 for two bedroom unit. * Carpet Steam Cleaning $3.00 per Sqm or $30.00 per average room( 10 Sqm). All Stains and soil Treated. * Chair Steam Cleaning from $15.00 up to $20.00 per chair. * Lounge Steam Cleaning $30.00 per seat.